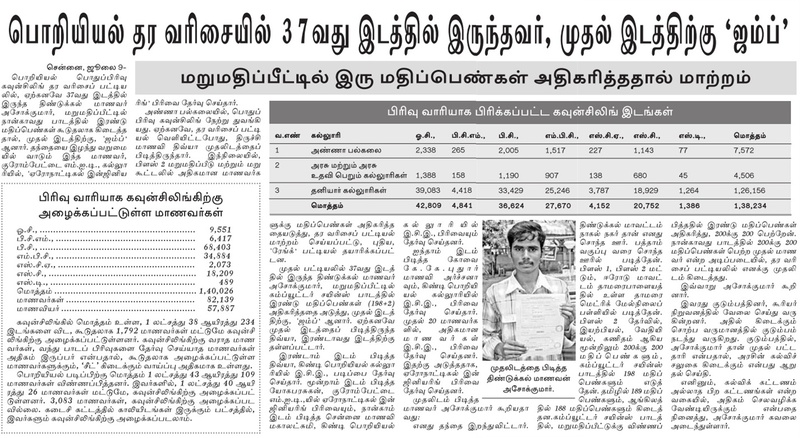 It is a different story for Ashok Kumar of Dindigul who was in the 37th position jumped to 1st position because of retotalling. 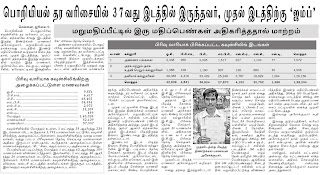 Ashok Kumar who had his entire medium of study in Tamil has topped and taken AERONAUTICAL ENGINEERING in the counseling as the first candidate, top candidate. Divya who was in the first rank has been moved to 2nd position, who has opted for Electronics and Communication in the Guindy Engineering College. Ashok Kumar who has lost his father at the age of 3 was brought up by his mother along with other two brothers. Bank people have promised to help by providing loan to Ashok Kumar. We wish Ashok Kumar to become another Abdul Kalam. Ashok Kumar has ambition to become a scientist with ISRO. Just see the Tamil clip given above.